Have you ever seen what happens to an aluminum can when it freezes? Or more succinctly – have you ever seen it after it’s ruptured and the contents have thawed? The power of ice and water (or liquid) is nothing short of awesome. Ice carved the great valleys of our country – and we all know what a raging flow of water can do. In a similar way, the power of ice and water can impact properties of all types if we’re not paying attention and prepared. A quarter of a million homes throughout the U.S. have at least one room damaged by frozen water pipes each winter according to State Farm Insurance. That’s 250,000 families disrupted by damage, lost possessions and the inconvenience repairs bring – during the coldest time of the year no less. What’s more, the Institute for Business and Home Safety reports that claim payments for losses related to water damage or freezing has exceeded $4 billion over the past decade. Damage from frozen pipes can be significant, and expensive. The average claim for water damage due to frozen pipes is about $15,000 according to esurance.com. It’s not only the pipes that contribute to this cost – In fact – it’s not the freeze – it’s the thaw. According to the Institute for Business and Home Safety, once a frozen pipe bursts as much as 250 gallons per day can escape from a one-eighth inch rupture. And for multi-family properties, chances are the damage will not be isolated to the unit experiencing the leak. Water can quickly travel to other units on the same floor and below increasing damage and costs. Walls, ceilings, flooring, décor and anything in the path of the water can be affected. The IBHS notes that claims for frozen pipe related failures “resulted in losses that were roughly twice as severe as those caused by plumbing supply system material failures.” What do these numbers tell us? Homeowners, property managers, condo residents and even renters need to be diligent in their focus of just how important it is to be aware and prepare for the potential damage cold weather can cause. Being aware means understanding all of the places the potential for a frozen pipe exist. Interior pipes positioned along exterior walls (especially North facing), outdoor spigots, swimming pool lines, water sprinkler/fire suppression systems, especially those in large open areas such as lobbies or vestibules, can all be affected by extreme cold. Awareness is only the first step. Preparation is the key to prevention. Prior to the cold weather setting in it’s recommended that homeowners, and property managers, review their property for potential winter water issues. According to Mike Lawyer, Director of Plumbing for DRF Trusted Property Solutions (DRFtps.com), “It’s absolutely critical that a property be reviewed and steps taken to protect areas that are susceptible to freezing due to exposure to extreme temperatures”. Lawyer recommends checking the property two times per year. Once prior to the cold weather to prepare, and once in the early spring – just to make sure no damage occurred. Lawyer continues: “There are actually two states to being prepared. Proactively protecting your pipes, and the response to extreme cold weather events.” As one can imagine prevention is a much less expensive proposition than the repairs and hassle a broken pipe brings. First, know what you’re insured for. Call you agent and learn what your policy protects you against. Then as you review the property take measures to insulate pipes and water lines that can come in contact with cold weather. Building maintenance staff can implement simple measures to protect against issues. Installing heat tape, foam insulation and other inexpensive products, which are available at most hardware stores, can protect pipes from freezing. Don’t forget the outside water supply as well. Turn off the water to outdoor spigots and use an inexpensive foam cover the block the wind. Despite the amount of pre-planning that’s done – there’s always the possibility of a cold weather event overwhelming even the most diligent planning. The next level of preparation involves the steps that can be taken to avoid frozen pipes in the moment. How do you know that there may be a problem? When it’s cold walk through your property and observe your pipes. Are there obvious signs such as bulges, or frost on the pipe? Is the flow of water from a faucet significantly reduced – or not present at all? How about the toilets? Are they not flushing? It’s time to act when you encounter any of these signs. Opening the doors under kitchen or bathroom cabinets and allowing warmer air to circulate is one commonly recommended tactic. Making sure you maintain a consistent temperature bears repeating. If the residence has a water line in or adjacent to the garage or other unheated space, keep the door closed. Lastly – one bit of common knowledge – let the faucet trickle. Having the water flow protects a pipe from freezing. Even with proactive measures taken to prevent freezing, the worst can happen. What next? If there’s no rupture the sooner steps are taken to get water flowing again the better. However, according to DRF’s Mike Lawyer, “if you see a break in the line and it’s still frozen, shut the water main off and call your plumber right away.” The ice can actually block the hole – and when it thaws water will leak through the break”. Turning the water off even if a rupture has not happened is the first step you should always take. Warming the pipes is the next step. But, never use any device that has an open flame. That’s a good way to start a fire and potentially destroy the whole property. In 2017 the Chicago Tribune reported on at least four structure fires caused by people attempting to thaw pipes with open flames in one 10-day period. Even a high wattage light bulb presents a danger. So, what can be used? The Red Cross recommends keeping the faucet open and applying heat with an electric heating pad wrapped around the pipe, an electric hairdryer or portable space heater or by wrapping pipes with towels soaked in hot water. 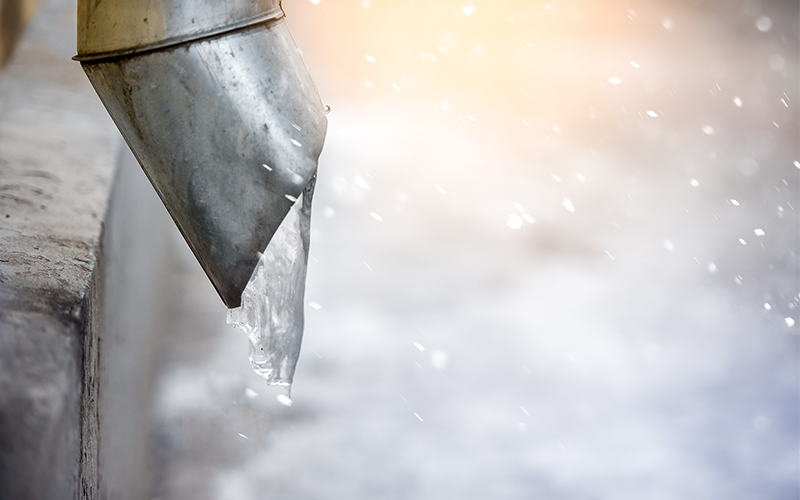 The key to avoiding the costs and frustration of frozen pipes is pretty simple actually – Awareness, Preparation, and Action. Before the cold sets in be aware of what areas of your particular property could be vulnerable. Prepare for the worst by taking action to protect the property and avoid potential damage.